As an organization that is committed to giving young people the opportunity to learn about global issues and to become actively involved in making a positive difference in the world, Peace Boat US is pleased to announce its new internship collaboration with the NYC iSchool. Located in Manhattan, New York, the NYC iSchool is an innovative high school dedicated to preparing young people for leadership in the 21st century, and to giving students opportunities for meaningful and relevant work. It offers courses that allow students to become well rounded individuals who are able to engage in discussion about a wide range of topics. The school’s methods and aims are an excellent match to the internship program of Peace Boat US, which provides opportunities to young people for hands-on learning, local and global cooperation, and involvement in our world’s most pressing issues. 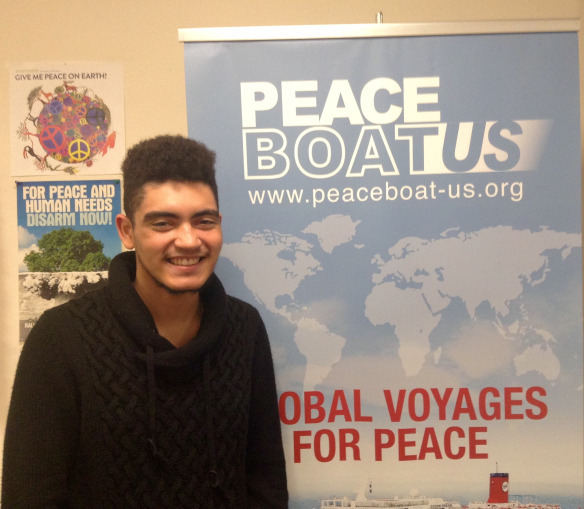 Under the guidance of NYC iSchool teachers Nathan Snyder and William Gibbons, senior Evan Hart recently joined the Peace Boat US intern team. He has a passion for global studies that was fueled by his previous participation in a study abroad program in Vietnam, and he regularly takes the initiative to inform himself about global events. By joining the Peace Boat US internship program, Evan will be able to participate in United Nations activities, and further develop his passion for international studies. We are looking forward to providing him with skills and experiences that will allow him to continue to flourish as an informed and active member of the world.